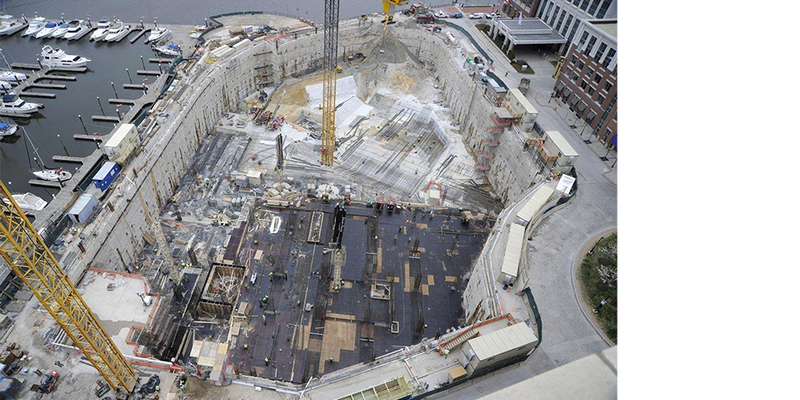 Sample Geotechnical Engineering Projects | Geo-Technology Associates, Inc.
GTA provided geotechnical, environmental assessments and permitting, geohydrological, and construction phase testing and consultation services for the $580 million, Four Seasons Hotel and Legg Mason Office complex in Baltimore’s Inner Harbor. The foundation, slurry wall, under-drain system, and mat foundations are constructed for this high-rise hotel/condominium and office building complex with a 22-story hotel and condominium tower encompassing 455,000 SF (with capacity of construction to 45 stories), and a 26-story, 600,000-SF office tower located directly adjacent to the harbor waterfront. This building also includes a five-story below-grade parking garage, which requires a 24-hour dewatering system due to the close proximity to the waterfront. The building is supported on mat foundations and required construction of structural slurry wall and temporary tie-backs for the below-grade portions. Explorations included borings, monitoring wells, seismic Cone Penetrating Soundings, and packer in-situ permeability tests. GTA performed geotechnical evaluations and analysis and developed recommendations for the design and construction of mat foundations. GTA assisted the design team in selecting a design that relieves the hydrostatic pressure under the mat that eliminated the need for costly tie-downs. GTA also prepared a geohydrologic model for the site and performed analysis using “ModFlow” to assess the seepage into the excavations and under the foundations after construction. GTA designed and prepared plans and specifications for an underdrain system to control and collect groundwater below the mat foundation set about 50 feet below the groundwater levels. GTA prepared specifications for construction dewatering. GTA monitoring displacements of adjacent high-rise buildings during deep excavation and construction of the underground parking garage. GTA monitored settlement and inclination of the buildings using instrumented survey techniques. Also monitored inclination of the parking structures slurry walls using inclinometers. GTA performed Phase I and II Environmental Site Assessments during the design phase of the project. An environmental management plan was prepared to provide guidance and requirements for monitoring and disposal of contaminated materials. GTA provided construction phase testing and observation for structural slurry wall, tie-backs, mat foundations, and underdrain system. During the construction of slurry wall, chromium-contaminated groundwater was encountered. GTA provided coordination with regulatory agencies and oversight for permitting, collection, treatment, and disposal of about 1.5 million gallons of contaminated water and sediments. 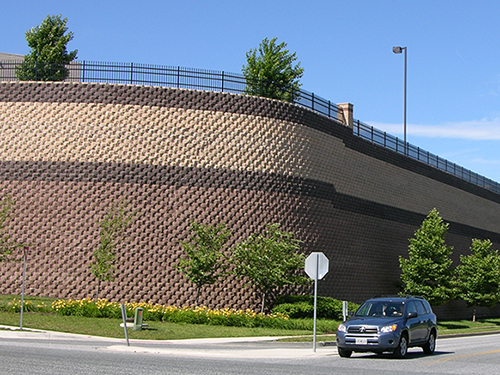 GTA provided design, specification, and installation details for an instrumentation program to assess movement of the slurry wall and surrounding structures and pore pressures changes outside the slurry wall. The monitoring also included sampling of groundwater and sediments to assess contamination. GTA’s services allowed the client to identify and implement cost-effective solutions for geotechnical, environmental, and groundwater control issues. GTA’s prompt response/recommendations to troubleshoot and resolve issues during construction allowed the project to proceed without delays. 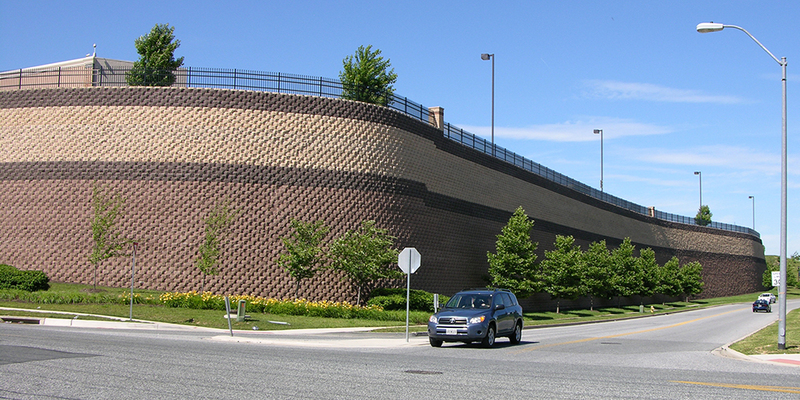 GTA designed a modular block retaining wall to support the proposed 140,000 +/- square foot Wegmans grocery store at the Boulevard at Box Hill as well as its associated pavement areas and subsurface utilities. In conjunction with our design, GTA performed a geotechnical exploration within the area of the retaining wall to determine the subsurface conditions within the zone of influence beneath the wall. The design included both internal and global stability analyses to assess the long-term stability of the fill and underlying Potomac Clay deposit. GTA also provided construction observation and testing services during construction of the wall which required over 40,300 square feet of Keystone Standard 21.5-inch block to achieve its final dimensions of over 1,340 feet long with a maximum exposed height of over 40 feet. The drainage pipes at the base of the wall and behind the reinforced fill are interconnected and drain beneath the wall directly into the public storm drain system. The wall backfill consisted of native sand and gravel and was reinforced with Mirafi geogrid. The structural components of the wall took less than two months to construct. 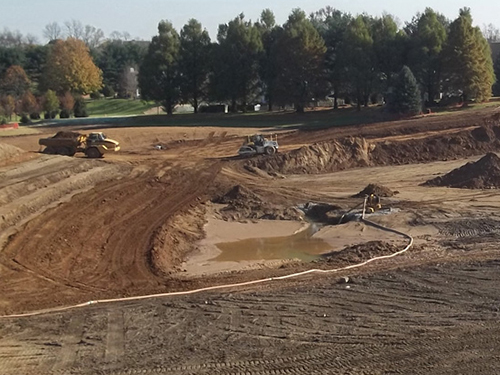 GTA provided geotechnical engineering for the 21-million-gallon water impoundment structure at Wilmington Country Club. 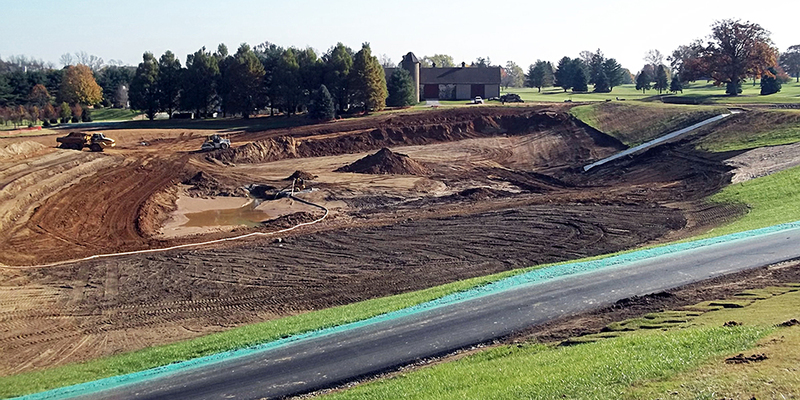 Services included subsurface exploration and well installation, groundwater monitoring, slope stability and seepage analysis, and earthwork recommendations during design and review of the earthwork and engineering consultation during construction. GTA provided geotechnical services for the construction of a six-level precast concrete parking structure in Lancaster, Pennsylvania. The garage required excavations up to 17 feet in depth within an urban environment with existing structures on two sides of the proposed garage. Based on the original design, the proposed foundations could not be economically installed using conventional shoring systems. 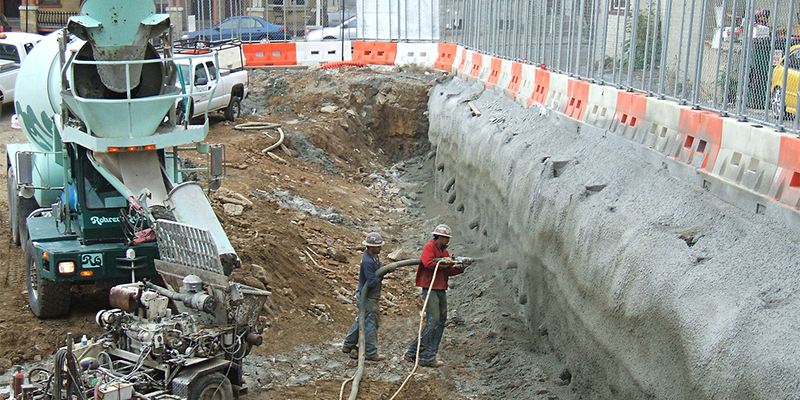 GTA designed a permanent shoring system that would also function as a permanent pressure relief wall. This allowed the proposed footings to be redesigned and conventional shoring systems to be economically installed. 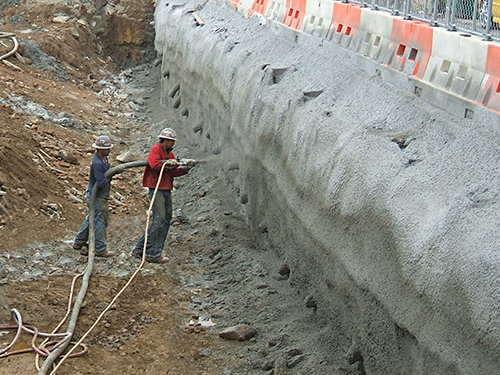 For the permanent pressure relief wall, GTA designed a soldier pile wall with shotcrete lagging and a soil nail wall with shotcrete facing. GTA provided observation and testing during construction, including test nail evaluation. GTA designed the micropile system to support the proposed garage footings on the underlying limestone bedrock. Two types of micropiles, consisting of 7-inch and 9 5/8-inch diameter, were designed. GTA provided observation and testing for the test pile. GTA also designed an underpinning system to support an adjacent structure. 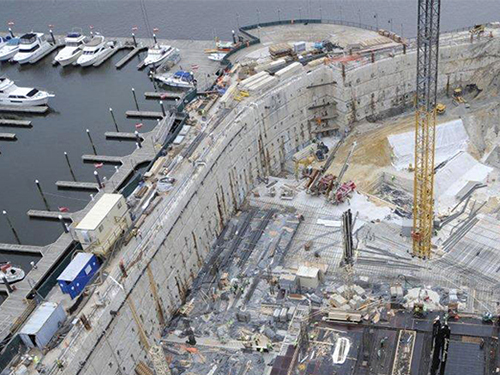 The underpinning design used a pit system that extended to depths of up to 7 feet. 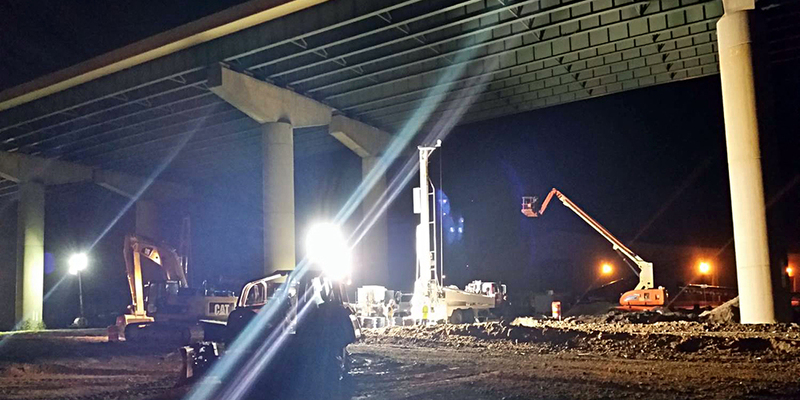 GTA provided emergency response and corrective action services including subsurface exploration and geotechnical engineering services to repair BR1-183 on I-495 over Christina River in June 2014 through its open-ended contract with Walton Corporation. GTA’s engineers and scientists worked diligently 24/7 for 12 days in order to obtain the necessary subsurface exploration for the design team. Working conditions were tight as contractors worked to remove a soil stockpile thought to cause the bridge’s foundation to tilt and rotate, subsequently closing the bridge for almost four months. 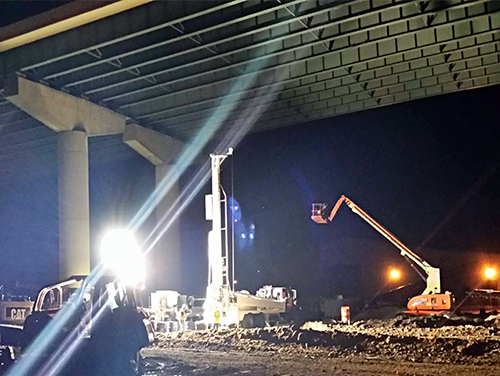 Given the limited access underneath the bridge, it was imperative that the subsurface exploration and instrumentation be installed prior to the foundation contractor mobilizing to the site. Staff engineers performed borehole logging for six Standard Penetration Test borings and approximately 120 feet of rock coring performed by Walton Corporation. The elevated pore pressures at the project site made for difficult drilling conditions. GTA performed 12 Cone Penetrometer Test soundings along with pore pressure dissipation tests, and GTA also monitored pore pressure through monitoring wells, pressure transducers and vibrating wire piezometers installed during those days. GTA oversaw the installation of that instrumentation, as well as two in-place inclinometers with automated readings. The instrumentation was monitored remotely using a data acquisition system. The instruments were monitored for approximately 12 months by GTA, who performed data reduction and provided Delaware Department of Transportation (DelDOT) with a monthly summary. GTA supplemented consolidation testing performed by DelDOT’s in-house laboratory by performing unit weights and loss on ignition tests of undisturbed samples, 14 Unconsolidated Undrained Tests and 14 compression tests on rock.